The Court of Appeal (COA, formally "Her Majesty's Court of Appeal in England") is the highest court within the Senior Courts of England and Wales, and second in the legal system of England and Wales only to the Supreme Court of the United Kingdom. The COA was created in 1875, and today comprises 39 Lord Justices of Appeal and Lady Justices of Appeal. The court has two divisions, Criminal and Civil, led by the Lord Chief Justice and the Master of the Rolls respectively. Criminal appeals are heard in the Criminal Division, and civil appeals in the Civil Division. The Criminal Division also hears appeals from the Crown Court, while the Civil Division hears appeals from the County Court, High Court of Justice and Family Court. Permission to appeal is normally required from either the lower court or the Court of Appeal itself; and with permission, further appeal may lie to the Supreme Court. The appeal system before 1875 was "chaotic". The superior courts system consisted of 12 different courts, with appeal on common law matters to the Court of Exchequer Chamber, chancery matters to the Court of Appeal in Chancery and other matters to the Privy Council. This was the subject of a review by the Judicature Commission, established in 1867 to consider the creation of a "Supreme Court" (a High Court and Court of Appeal). The result was published in 1869. The recommendation was that there should be a common system of appeal from all of the High Court divisions, with a limited set of appeals allowed to the House of Lords. This reform was implemented by the Judicature Acts, with the Appellate Jurisdiction Act 1876 giving an almost limitless right of appeal to the Lords. The new legal structure provided a single Court of Appeal, which heard appeals from all the various divisions of the new unified High Court of Justice. It only heard civil cases: opportunities for appealing in criminal cases remained limited until the 20th century. In its early days, the Court of Appeal divided its sittings between Westminster Hall for appeals from the Common Law divisions, and Lincoln's Inn for Chancery, Probate, Divorce and Admiralty appeals, with five Lords Justices. After the opening of the Royal Courts of Justice in 1882 the Court of Appeal transferred there, where it remains. As well as the Lords Justices, the Lord Chancellor, any previous Lords Chancellor, the Lord Chief Justice, the Lords of Appeal in Ordinary, the Vice-Chancellor of the Chancery Division and the Master of the Rolls could also hear cases, although in practice only the Master of the Rolls did so. The absence of limits on appeals to the House of Lords was the cause of much concern: it led to an additional set of expensive and time-consuming appeals from the Court of Appeal, which thus could not take decisions in the knowledge that they were final. 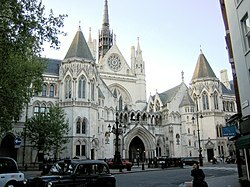 The appeals from the County Courts were seen similarly, involving an appeal to the High Court of Justice and the bypassing of the Court of Appeal for a second set of appeals to the Lords. The Administration of Justice (Appeals) Act 1934, a short statute, solved both problems neatly by abolishing the appeal of County decisions to the High Court and instead sending them automatically to the Court of Appeal, and by establishing that appeals to the Lords could only take place with the consent of the Court of Appeal or of the Lords themselves. A second set of reforms to the appeals system followed the report of the Evershed Committee on High Court Procedure in 1953, which recognised the high cost to the litigants of an additional set of appeals, particularly since the loser in a civil case paid the victor's legal bills. Among the few changes that were made, the practice ceased of counsel reading out the judgment, cross-examinations, documents and evidence given in the lower court; this saved time and costs. The process of "leapfrogging" (appealing from the High Court to the House of Lords without needing to go through the Court of Appeal), which the Committee had recommended, was eventually brought into force with the Administration of Justice Act 1969. A separate Court of Criminal Appeal had been established in 1908. In 1966 this was merged with its older namesake, establishing the present-day structure of a single Court of Appeal with two Divisions: Civil and Criminal. In the early 1960s there was discussion between judges and academics in the United Kingdom and the United States comparing the processes of appeal used in each nation. Although the British judges found the emphasis on written arguments unattractive, they did like the idea of pre-reading: that the court should read the pleadings of counsel, the case being appealed and the judgment from the lower court before delivering its judgment. But the idea was quietly scrapped, despite a successful tryout in the Court of Appeal. The court over which Lord Denning presided from 1962 to 1982 was under no pressure and had no inclination to modernise, with liaisons and management[clarification needed] handled by clerks with little knowledge. [clarification needed] This changed in 1981 with the appointment of a Registrar, John Adams, an academic and lawyer, who significantly reformed the internal workings of the Court. In July 1996, Lord Woolf published Access to Justice, a report on the accessibility of the courts to the public. Woolf identified civil litigation as being characterised by excessive cost, delay and complexity, and succeeded in replacing the diverse rules with a single set of Civil Procedure Rules. Before Woolf had even published his final report, Sir Jeffery Bowman, the recently retired senior partner of PriceWaterhouse, was commissioned to write a report on the Civil Division of the Court of Appeal. Bowman noted a growing workload and delays, with 14 months between setting down and disposing of a case in 70% of cases, the rest taking even longer than that – some had taken five years. He recommended extending the requirement to ask leave to appeal to almost all appeal cases; allowing certain appeals to be heard at a lower level; focusing of procedure; imposition of time limits on oral arguments; and the use of judicial time more towards reading and less towards sitting in court. Bowman's recommendations were mainly enacted through statutory provisions, such as Part IV of the Access to Justice Act 1999. In Tanfern Ltd v Cameron-MacDonald  1 WLR 1311, Brooke LJ laid down the procedural methods of the Court of Appeal post-Woolf and Bowman. With a few exceptions, such as cases where "the liberty of the subject" is an issue, permission is required to appeal, and may be granted either by the lower court or by the Court of Appeal. As a general rule, appeals are now limited to a review of the decision of the lower court, only allowing a full appeal where there was a serious procedural irregularity or the decision was wrong through "blatant error". The Civil Division deals with all non-criminal cases, and has been part of the Court since its establishment in 1875. The Civil Division is bound by the Supreme Court of the United Kingdom when making decisions, and is normally bound by its own previous decisions, with four exceptions; where the previous decision was made without the judges knowing of a particular law; where there are two previous conflicting decisions; where there is a later conflicting Supreme Court or House of Lords decision, and; where a law was assumed to exist in a previous case but did not. The first three were established by the case of Young v Bristol Aeroplane Co Ltd in 1946, the fourth by R (on the application of Kadhim) v Brent London Borough Housing Benefit Review Board in 2001. The Civil Division is led by the Master of the Rolls, currently Sir Terence Etherton (who is entitled to the post-nominal MR), assisted by the Vice-President of the Civil Division, Sir Martin Moore-Bick. The division hears cases from the High Court of Justice, County Courts and several tribunals. Although the Lord Chief Justice is senior to the Master of the Rolls, the Civil Division is much broader in scope than the Criminal Division. With only three judges on the bench (rather than five or more in the Supreme Court), this allows the Master of the Rolls huge opportunity for shaping the common law and, most notably, Lord Denning made the most of this potential. The Criminal Division was established in 1966 with the merger of the Court of Criminal Appeal into the Court of Appeal. It hears all appeals from the Crown Court which are in connection with a trial on indictment (i.e. with a jury) and where the Crown Court has sentenced a defendant committed from the Magistrates' Court. It also exercises the jurisdiction to order the issue of writs of venire de novo. The Criminal Division, while bound by the Supreme Court, is more flexible with binding itself, due to the heightened stakes in a case where a possible penalty is a prison sentence. The Division is led by the Lord Chief Justice, currently Lord Burnett of Maldon, assisted by the Vice-President of the Criminal Division, currently Lady Justice Hallett. The Court of Appeal's main judges are the Lords Justices of Appeal and Lady Justices of Appeal. The Senior Courts Act 1981 provides that the Court of Appeal comprise 39 ordinary sitting Lords and Lady Justices and the Lord Chief Justice, Master of the Rolls, President of the Queen's Bench Division, President of the Family Division, and Chancellor of the High Court. Retired Lords and Lady Justices sometimes sit in cases, as have retired Law Lords, and High Court judges are allowed to sit on occasion and, in the Criminal Division, there are a number of Senior Circuit Judges authorised to sit as judges of the Court of Appeal (Criminal Division). Lords and Lady Justices have, since 1946, been drawn exclusively from the High Court of Justice; prior to this, Lords Justices were (rarely) recruited directly from the Bar. Dame Elizabeth Butler-Sloss was the first woman appointed as a Lord Justice of Appeal in 1988; she was known officially as "Lord Justice" until a practice direction was issued in 1994 to refer to her informally as "Lady Justice", and the official title in section 3 of the Senior Courts Act 1981 was amended by the Courts Act 2003. Dame Kathryn Thirlwall was the twelfth Lady Justice, appointed in 2017, bringing the number of active Lady Justices to 9 out of 39. The division of work in the Court of Appeal is demonstrated by the 2005 statistics, in which Lords and Lady Justices sat 66% of the time, High Court Judges 26% of the time and Circuit and Deputy High Court Judges 8 per cent of the time. Lord and Lady Justices are currently paid £188,900, with the Master of the Rolls paid £205,700 and the Lord Chief Justice £230,400. The Civil Division is led by the Master of the Rolls, currently Sir Terence Etherton, who uses the postnominal MR; the Chancellor of the High Court and President of the Family Division regularly, for a period of weeks, lead the Civil Division. Several Civil Division Lords Justices are seconded to the Criminal Division, which is currently led by the Lord Chief Justice, Sir Ian Burnett. On 31 October 2013 the Court of Appeal allowed cameras in the court for a (70-second broadcast delay) "live" broadcast feed for the first time. Cameras were banned in all courts in 1925 (although they were allowed in the Supreme Court of the United Kingdom from its 2009 inception). Cameras have now been allowed in some courts due to changes made by the Crime and Courts Act 2013. Currently, only one court can be broadcast per day. The Ministry of Justice announced the move via Twitter. ^ "Lords Justices of Appeal". Archived from the original on 28 July 2012.